The two databases listed here, both available on the internet, are a great first step in finding a catalogue raisonné for a graphic artist or a fine artist, respectively. Bibliography of oeuvre-catalogs, defined as any print listing of an artist’s total output, or some clearly defined section of that output. Catalogs of the output of print publishers and publishing houses also included. Publications on a given artist or publisher are displayed chronologically by publication date, from earliest to most recent. Searchable by artist’s last name or publisher whose work is being cataloged. Click “Notes” for instructions on searching artists known by dates, nicknames, or monograms. International Foundation for Art Research databases on oeuvre-catalogs for fine artists, one for published catalogues raisonnés and one for catalogues in production. Databases can be searched together or separately. The two databases above are comprehensive but not all artists are included in them; contemporary artists, in particular, may not have a formal published catalogue raisonné. Use WorldCat and/or highly respected art library catalogs (such as the Met, the Getty, the National Gallery, or the Art Discovery Group Catalogue, a subset of WorldCat that searches a treasure trove of art historical materials) to search for catalogues raisonnés that may not appear in the IFAR or PCA databases. In many cases, works may be cataloged with the subject heading catalogues raisonnés, and any search of WorldCat or a library catalog could start there. Edouard Manet. 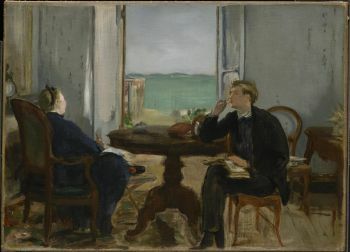 Interior at Arcachon, 1871. Oil on canvas. Sterling and Francine Clark Art Institute, Williamstown, MA.